France is roughly the size of Texas, so it’s hard to imagine that such a relatively small area could pack in so many diverse landscapes. 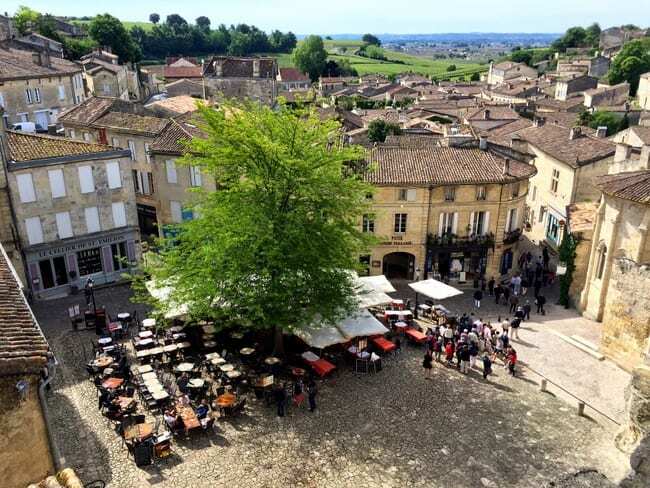 From rivers and canals to rugged cliffs and snow-capped mountains to lavender fields and vineyards and beyond, France’s beauty doesn’t go unnoticed. It’s truly an outdoors-man’s paradise. Ever since I moved here almost 5 years ago, it’s been important to me to see as much of the country’s beauty as I can… and from varying perspectives including the land and the water. As I mentioned in my intro to canal cruising post, Tom suggested that for summer vacation, we do a self-guided canal boating trip and was familiar with a company called Nicols because their boats are built not far from where we live. He showed me the website and I was sold. 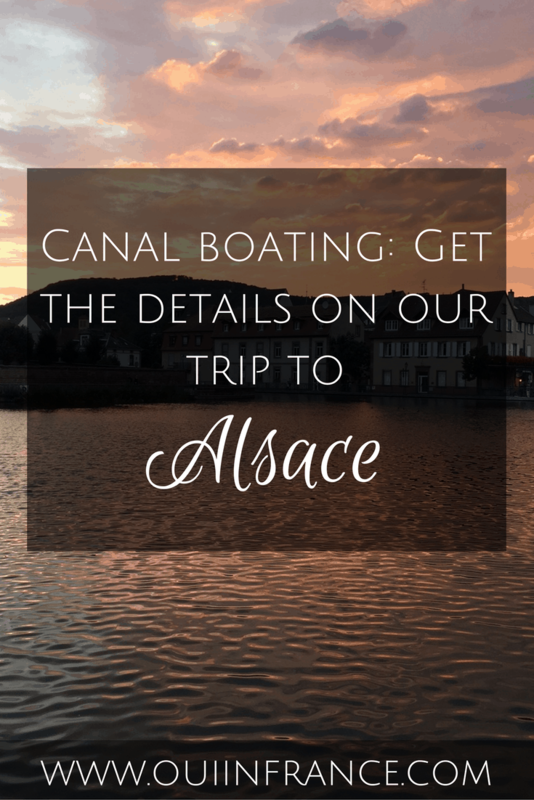 Seeing a new-to-us region of France from a different vantage point sounded exciting, so a few weeks ago Tom, Dagny and my in-laws set off for our getaway on the canals of Alsace. And wow, what a fabulous time we had! 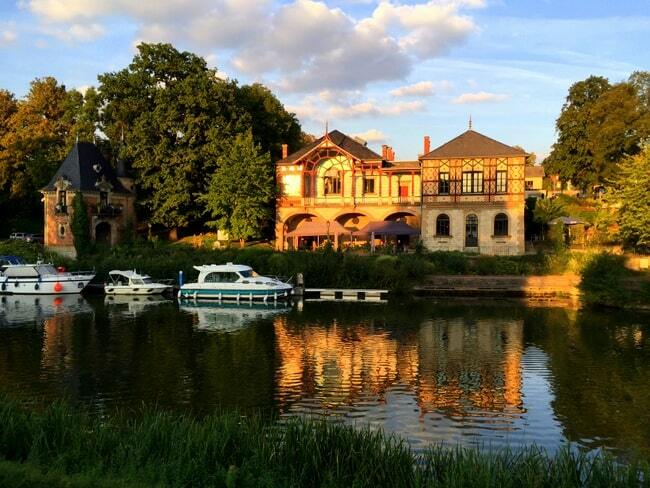 Read on for our canal holidays in France experience aboard a Nicols boat! As I mentioned in my intro post, Tom was familiar with the self-piloted canal boat rental concept and suggested Nicols. The company was founded in 1986 and became known for their high-quality range of boats as well as their boating vacations. All of the boats are 100% made in France and accommodate 2-12 people. 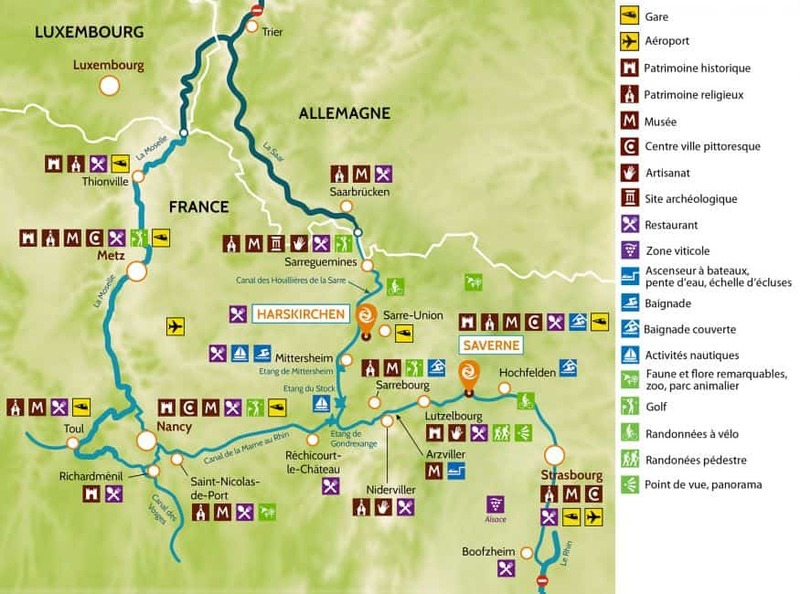 There are 24 bases in France, Portugal and Germany providing a whole host of sights and landscapes from which to choose. Safety is a priority for the company (more on that below) and their trips are family and dog friendly. Boat rentals span from weekend trips to multi-week endeavors depending on your budget and vacation plans. 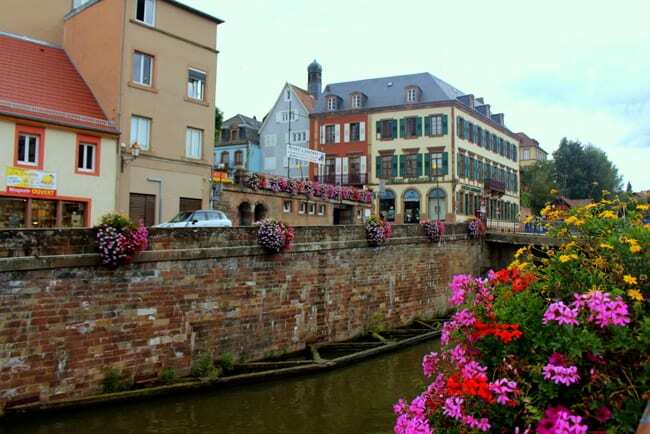 Although there are canals out where we live and in nearby regions like Brittany, we decided to visit a new-to-us area of France and headed east to Alsace. 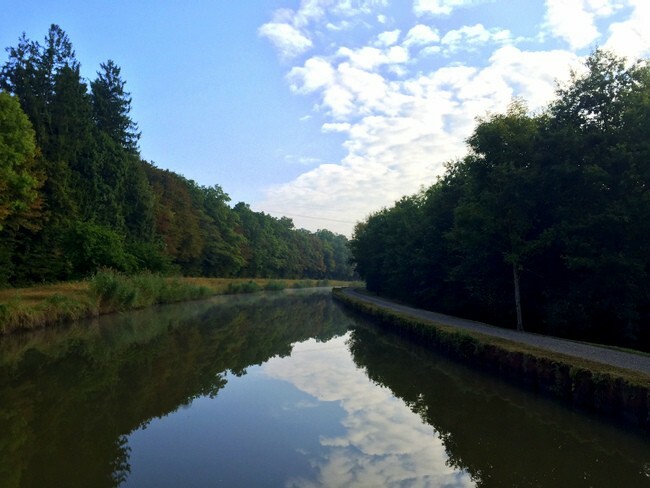 Canal holidays in France are a fantastic way to spend a week! The boat we called home for the week was the Nicols Sedan 1010. 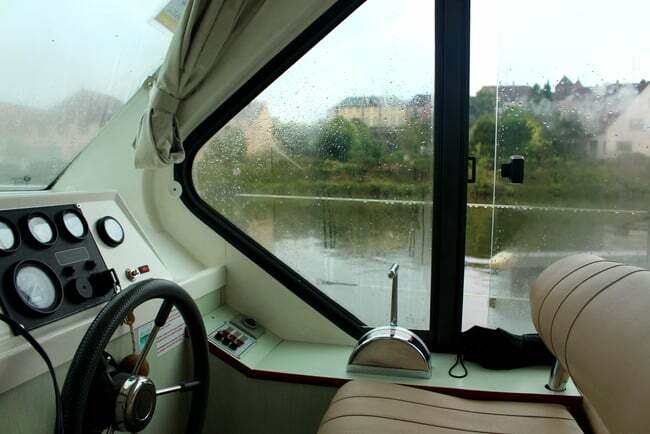 The 10-meter boat has 3 cabins, 2 bathrooms, plenty of storage space, a little kitchen complete with an upright fridge, stove, oven, sink, steering controls inside and up top and more. The boat can accommodate 6 (4 adults and 2 kids) but felt like the perfect size for our group of 4 and a dog. The kitchen area is light and airy and the outside deck area has enough room for a table and chairs if you’d rather dine al fresco. 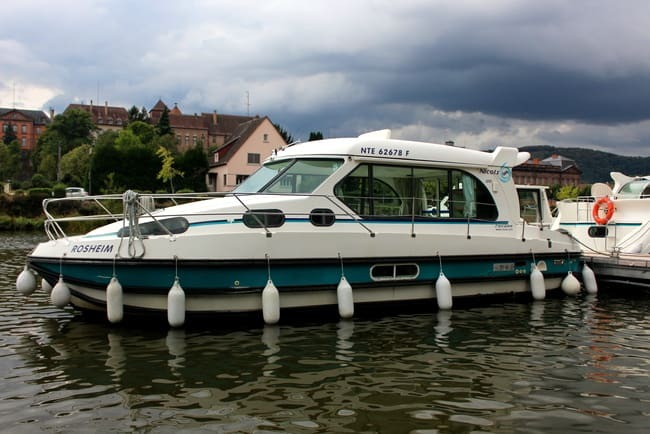 The boat holds 600 liters of water and you only need to fill up at port every 2-3 days. 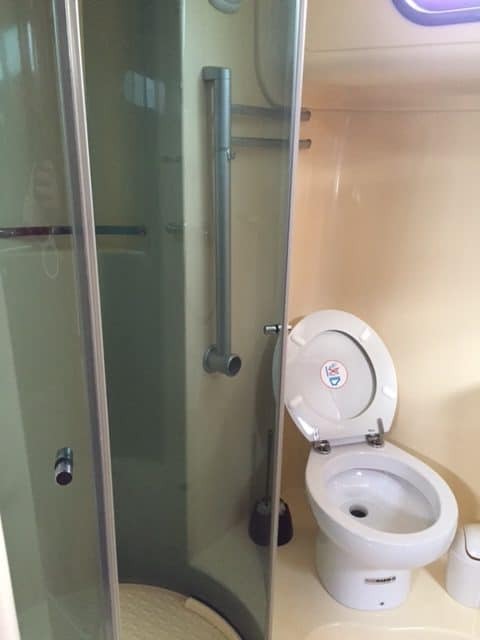 While it did have two showers, they were typical boat heads (small space where the sink faucet detaches from the sink and becomes a shower head) and did not have a separate shower cabin. To avoid water everywhere and to give ourselves a more comfortable showering experience, we opted to shower in the port facilities most of the time. Pictured below is the Port de Plaisance in Sarreguemines where the showers were top notch! If you opt for a larger boat, there are spacious shower cabins on board like these pictured below. That way if you dock in nature instead of the port — or are just more comfortable showering on the boat — you can shower without ever setting foot on land. When you arrive at the Nicols base, staff will take care of paperwork with you in the office and give you a canal guide and binder (in several languages) with all types of info about the boat, emergency numbers, routes, etc. They were friendly and welcoming and spoke several languages. After we were all set with the paperwork, we headed out to the boat and got situated. A Nicols employee went over basic maneuvers and where to find everything on the boat. It was at that time that they realized our boat had a slight battery issue and stayed almost 2 hours after their day ended to repair it for us. It was nothing serious but could have been an issue a few days into the cruise. Luckily, it was fixed and we were all set to go. 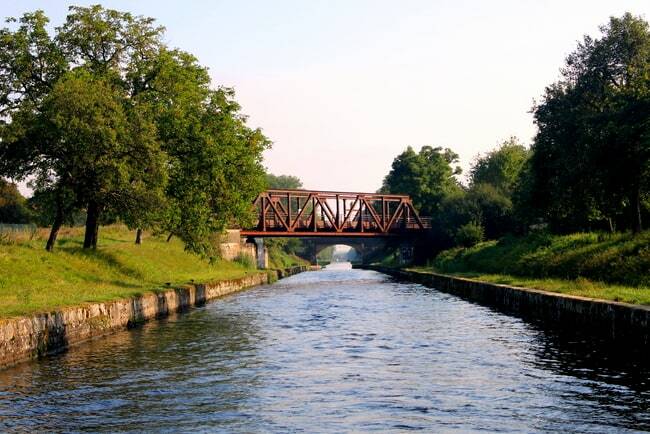 Keep in mind that if you don’t have a ton of boating experience, it may be best to cruise during the off season (June or September/October) for two reasons: 1) There’s less traffic on the canal. There were days when we’d pass only one or two boats the entire day and having the canal to ourselves was peaceful and stress free. If you aren’t too adept at maneuvering a boat and don’t want an audience at locks, it would make sense to consider a trip outside of peak tourist season in July and August. 2) It’s also cheaper. Our trip was a week long and started and ended on a Saturday. 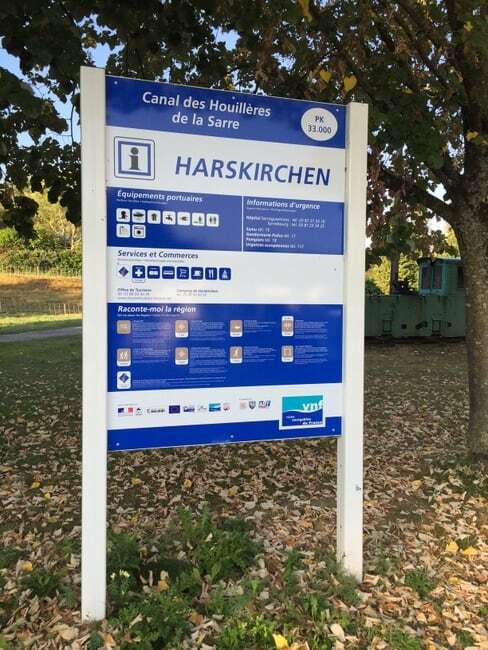 We started in Saverne and turned the boat in at Harskirchen on the following Saturday. The exact route, pace and stops are entirely up to you and you can cover as much or as little ground as you’d like. The speed limit on the canal for non-commercial vessels is around 8km/hour so take that into account when planning your route. Locks can also slow you down if you have to wait for them to be ready. Canal cruising is slow and relaxed and gives you time to take in the nature around you and completely unplug. That’s part of its appeal! I’ll be sharing more pictures and info about the places we docked in a future post. Saturday: Arrived in Saverne, grocery shopped, explored town center and stayed the night in port. Sunday: Early departure and headed west for an overnight stop in Lutzelbourg. Monday: Continued cruising west and stopped in Niderviller for the night. 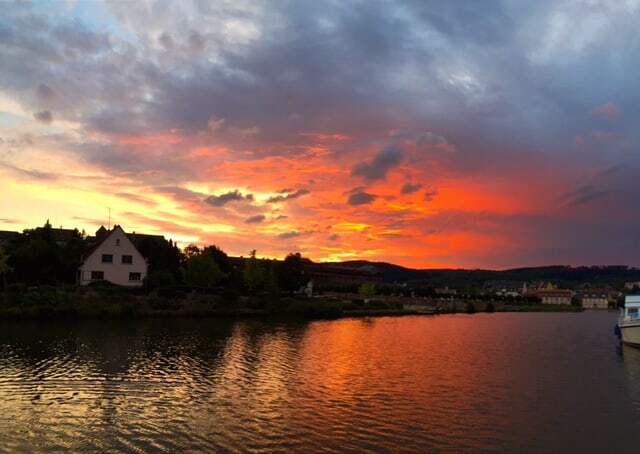 Tuesday: Full day of cruising and locks and headed north to spend the night at Mittersheim. Wednesday: Another full day of cruising north up to Sarreguemines where we spent two nights. Thursday: Spent the morning in Sarrguemines and then took the tram over the German border to Saarbruck. Friday: Morning departure south to the Nicols base in Harskirchen. Spent night in Harskirchen. Saturday: Packed up and left boat around 10am. Taxi back to Saverne to get our car and start the trek home. 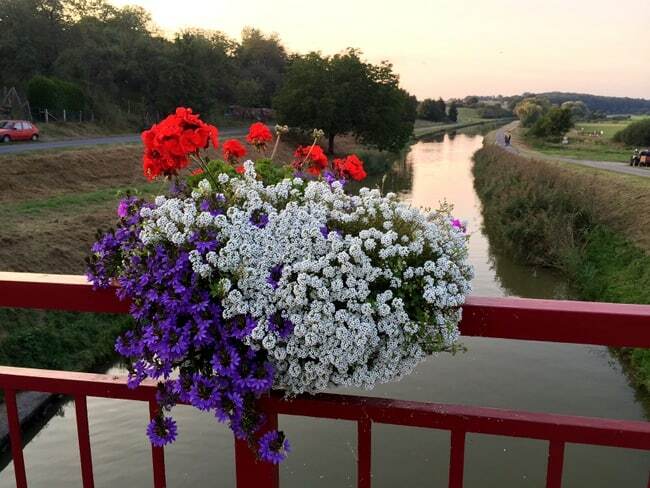 Canal holidays in France are equally beautiful, calm and relaxing. There are no waves and you wouldn’t even know you’re on a boat most of the time except when other boats pass. The tranquility of being in nature and taking in your surroundings was a welcome change for us. As I mentioned, Nicols gives you route suggestions but the choice is yours. Most of the time, trees will surround you and envelop the canal. There was a paved path in many sections of our route and we often waved to bikers, walkers and joggers who frequently passed us by. On most days, we only passed a small handful of boats, if that. The canal gently weaves through small towns and residential areas at times and passes under bridges and even through two tunnels on our route. Locks, locks and more locks! Our route over the course of the week included 30 plus locks including 14 on one day alone. 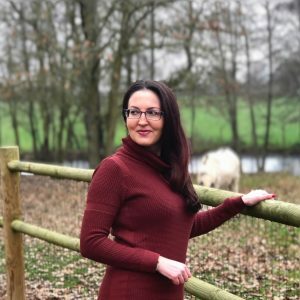 I’ll be writing more about locks because they’re part of the fun and deserve their own post! At first, I was a little nervous because they seemed intimidating but there’s nothing to be nervous about. None of us had any lock experience before so it was quite an experience maneuvering through the first couple of times although we got the hang of it pretty quickly. In theory, it’s one thing to know what you’re supposed to do (go in straight, efficiently attach lines, hold the boat steady, etc.) and another thing entirely to put it into practice. The speed limit on the canal is 8 km/hour so you definitely have time to yourself and won’t feel like you’re missing any scenery along the way. If you have a long day of cruising, don’t forget you can always switch captains — you don’t have to designate just one person to drive. You also have the option to drive from outside on the top of the boat. Most of Nicols’ boats have two controls so you can work on your tan at the same time. The slow speed allowed us first and foremost to feel in control of the vessel and that we were safe at all times. 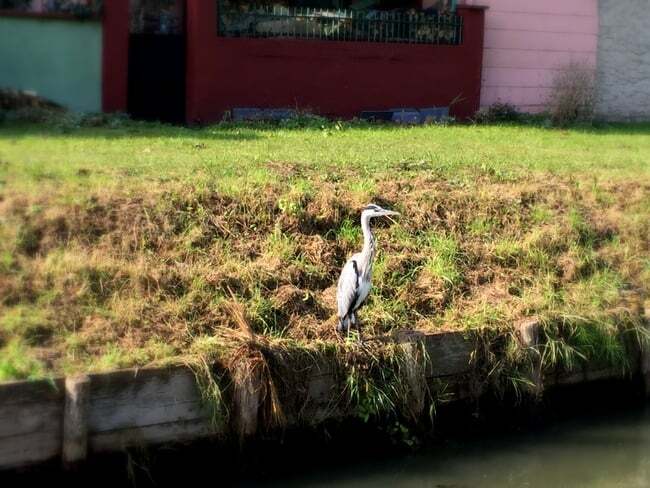 It also allowed us to see nature at its finest including herons, gallinule, some water snakes, fish and a whole host of other wildlife including farm animals like turkeys, cows and sheep. And someone, who will remain nameless, enjoyed a few naps along the way. Since you’re not moving too fast and the cruising is really smooth, you can easily divvy up tasks on board while cruising like straightening up or preparing meals without having to worry about the boat rocking. The price of our Nicols canal cruise included the boat rental, sheets, a comforter and pillows for our bed. 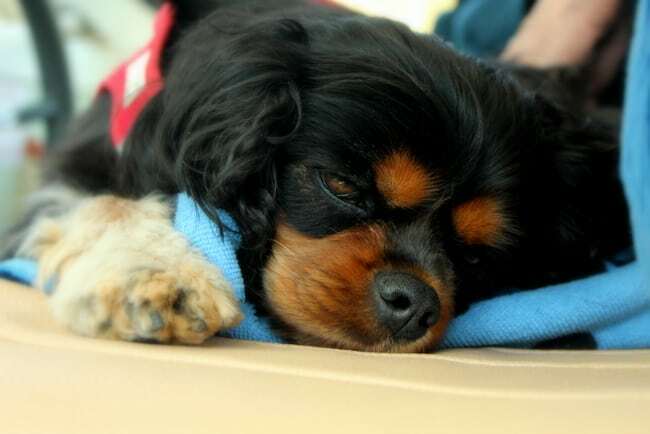 Additional costs are fuel and a small pet fee. We used approximately half a tank of gas. The exact usage will depend on how fast you cruise and how much ground you cover. For a week-long trip, expect to spend a few hundred euros in fuel. Optional items are towel rental (we brought our own), a Wi-Fi hotspot and bikes, and even a small BBQ. If you decide to dock in port (as opposed to mooring in nature along the canal), there’s a small overnight fee usually around 10 euros or slightly more if you’d like electricity, water, and access to use the showers. The port fees were euros well spent and I looked forward to my hot shower in the evening after a day on board the boat — especially on that first day when it rained and on days when my lines fell in the water — amateur mistake — and got me all dirty. Also, the cost of food isn’t included so we stocked up ahead of time in Saverne. Because many of the ports are quite small and not within walking distance of the village (and also close early if there is a little mini mart), it’s best to grocery shop for the majority of your food the week before leaving. Just allow enough time to get everything you need. The port facilities are marked in the guide and the signs also show you what’s around. At one port where a grocery store wasn’t too far, we decided to combine our workout with some grocery odds and ends and took the bikes for a 5-kilometer ride into town. I want to mention this next part because I know travel can be anxiety inducing especially when you’re in another country and experiencing something new. Nicols prioritizes the safety and security of their customers and we found this out first-hand on our second to last day somewhere on the canal north of Harskirchen (I still have no idea how to pronounce the name of that town). After coming through a lock, we noticed the canal had a bunch of grass clippings and vines floating on the surface from recent landscaping along the canal. Shortly after our boat slowed way down despite the throttle being fully engaged. We thought maybe vines got wrapped around our propellers so we put the boat in neutral and reverse and then resumed course hoping the maneuvers would free the vines. Unfortunately, the problem continued and then we lost steering. Again, this was all at a very slow speed so we continued to coast to the side of the canal and moored for lunch, not wanting to damage the boat or escalate the issue by continuing on. It was then that we called Nicols. They give you daytime and emergency numbers in the binder so you always have direct access to staff if anything happens. Within 10 minutes, Bernard called us back and made the 23-km trek to where we were. He determined that a rope in the canal had gotten sucked into our engine and that’s what was causing the trouble. He fixed us right up, made sure the boat was in working order and then we were on our way. 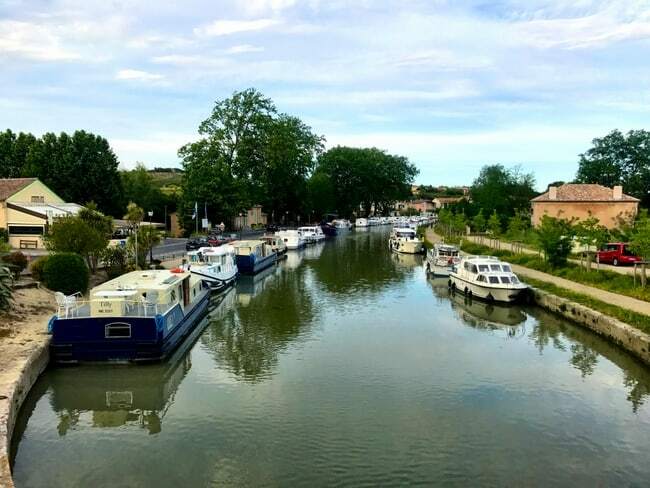 A Nicols canal cruise is a fantastic experience and I’d recommend it to couples, families with kids, multi-generation family trips and pretty much anyone who enjoys being on the water, seeing smaller towns, and wants a unique canal holidays in France experience off the beaten path! For more on Nicols, head over to their site here. Lots more to come on my canal cruise, so hope to see you back here soon. 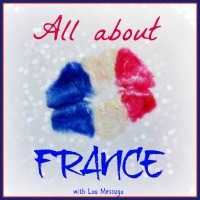 If you found this post on canal holidays in France interesting, would you mind sharing? 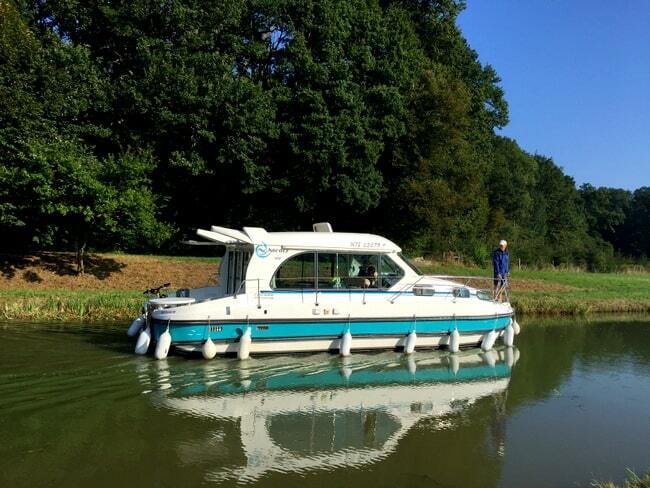 With the Canal du Midi running through our neighborhood, we see self-piloted boats all the time. I would say bikes are a must for getting out farther than the canal environs. The canals are so beautiful. A great way to see France. We went to the mountains today. TOTALLY DIFFERENT from just a few miles away on the plain. As you say, France’s diversity is amazing. 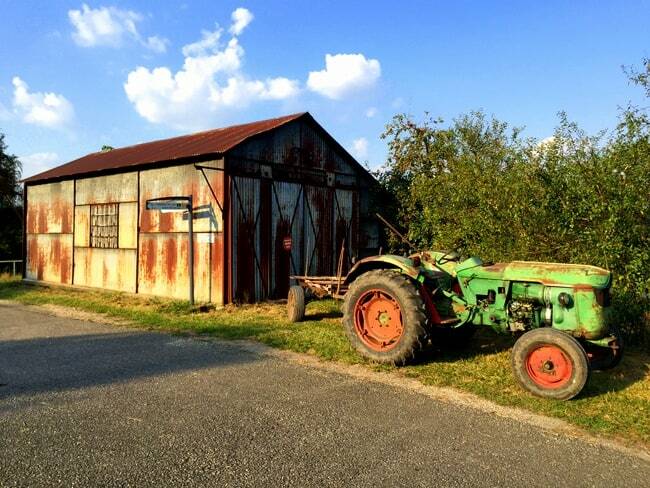 I’ve heard good things about the Canal du Midi — beautiful area! Thanks for taking the time to read the post. It was a lot of fun! Thank you for following along. Hope you book one for 2017! Thank you for posting so much info on your trip Diane. With only a couple of weeks until we pick up our little boat, it’s safe to say I devoured every word. I really hope our trip is as successful as yours was! You’re very welcome. So glad you found it useful. Hope you had a wonderful cruise with great weather! Wow! This looks incredible. Thanks for all the information. My husband has been wanting to do this for ages – and your boat looks sufficiently lovely to convince me that he might be right. You’re very welcome! The boats are totally equipped and available in a bunch of sizes so you can be more cozy or have a ton of extra space. You’ll love it! Awesome, it’s really a lot of fun! Like you, I had NO idea you could rent a boat like that without a boating license, so happy to spread the word. 😉 Thx for checking out the post! One other question, Annabelle, since you live in Germany. As I mentioned in the post, we spent the afternoon over the border in Saarbrucken and I thought you greet people with guten tag in German. I know about 3 words. But then I realized (upon buying a pretzel) that you just allo? Is guten tag formal or something? I tried my best and made sure to say danke at the end but they probably laughed at me. Haha I laughed at myself. This is something that Jo and I have talked about off and on many times over the years. We have never done it because I’m 6’8″ and have always figured that I would never be able to standup or fit into any berth. Sure looks like fun though. Hi Arnie, in all honesty, you might find some of the smaller boats a bit cramped but the larger boats should have enough headroom for you to not feel claustrophobic. Totally understand your hesitation though. This looks a fabulous trip. Despite living in France for 19 years, we don’t know Alsace at all and really need to go there. Drifting along on a canal sounds a really relaxed kind of holiday – although I daresay there are things that can go wrong. BTW, as a Brit, I like the way you say that France is a relatively small area – to us, it’s big!! But it’s all relative…. What a lovely idea! 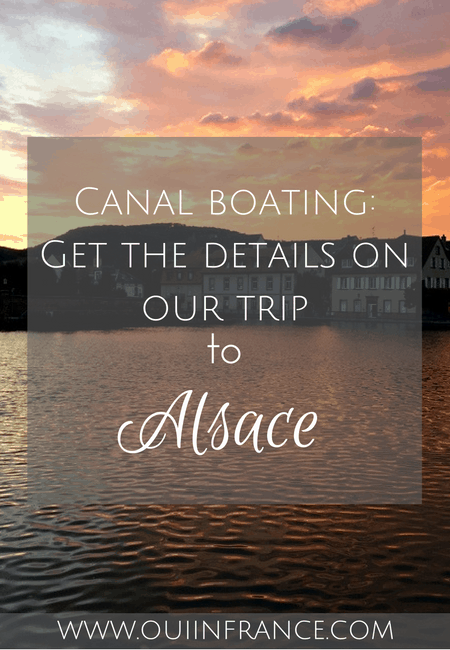 I’ve heard about canal boating in other parts of France, but this is the first insider look at a trip in Alsace for me. I’m really fascinated with the region and this must be an excellent way to get deeply involved. I’d worry about my boat “driving” skills though! With a little practice, you’ll be an old pro in no time. It can be a little stressful at first, but you’ll figure out how the boat handles. We didn’t have much experience at all and managed just fine. Thx for your comment, Jill, as always. Wow, what a cool trip! I didn’t know this was even a thing! Canal boating is definitely on my to do list, but down here in Provence on the Canal du Midi. Sounds like a lovely way to spend a vacation! FYI – I tried pinning to my France board but the pic is too small (thought you might want to know). Thank you so much for letting me know! On my boards, my feature images post but I know that I usually don’t create a separate Pinterest-sized image in instances where smaller images don’t work. If you don’t mind, would you scroll to the end of the post and try to pin the big graphic I just made? It’s formatted for Pinterest and should work. 😉 I’d really appreciate it. Thank you and I hope you do a cruise down in your area, so fun! It really was. Thanks for stopping by! Oh you can definitely walk, Christine! We wanted to cover a lot of ground so a few days were spent on the boat cruising but if you want to hit just a few ports, you can take advantage of the bike/walking paths that run along the canals. Or cruise during the morning and get out and walk all afternoon. Lots of options depending on what kind of trip you want! I always stare wistfully at canal boats when I see them. 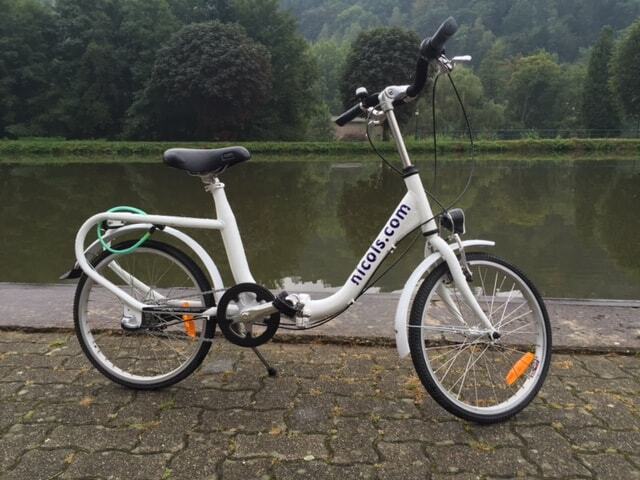 I’ve wanted to go on one for the longest time… France seems like the perfect country for it too! That’s such great service that they came right out to fix up your boat when you hit a snag. 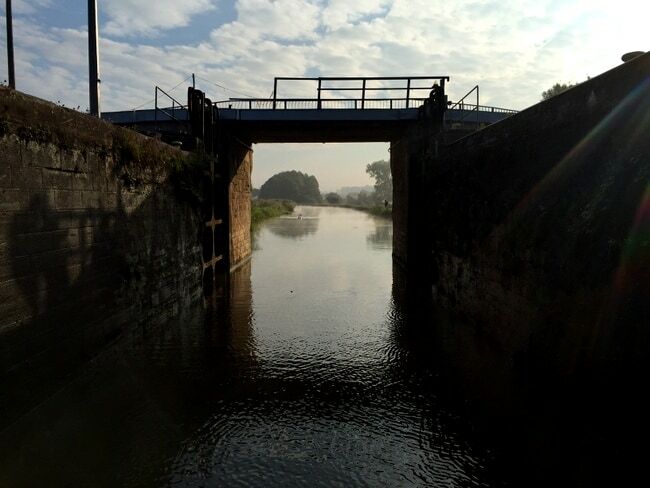 That’s my only concern about a canal boat holiday – getting stranded! Yes, I’m not sure about other companies but Nicols has someone on-call at all of their bases 24/7 so if you do run into trouble, you’re not on your own. But you can only cruise until dusk — I think the rule was 7pm or so — so at night you can dock and just relax and not have to worry about navigating in the dark. If you’re considering it, just go for it one of these days!